Whether you’re protecting our streets, our borders, or our freedoms while abroad, if you have the need for true effectiveness in a small package, look no further than the Spike’s Tactical EDW in 6.8x43mm. I met the guys at Spike’s during a show in 2009 when a good friend of mine introduced us. I met Mike Register (Spike), the owner, and Tom Miller who is now the CEO. At that time Tom was the main builder at Spike’s. Tom comes across as your average guy, in fact he’s very quiet and soft spoken. But what’s lurking in that brain of his is nothing short of the kind of artistry and exactness that is displayed by only the world’s most renowned artists and highest paid engineers. Tom is a genius when it comes to building AR’s. He recently let on to me that he built race engines for 6 to 7 years; knowing that puts some things into perspective. All that means for you is that you get some wickedly good stuff. vation, quality, and a 100% commitment to the customer and the delivered product. If it can be conceptualized, Spike’s can build it, and build it right — 100% satisfaction, day or night, yesterday or 5 years from now, first owner or 6th owner of the firearm. They use and make the best parts possible and always meet or exceed Mil-Spec. Spike’s brought nearly 20 new innovative products into production within the last year. They have the rare ability to take a concept, engineer it, develop/machine a prototype, test it, and bring it into production in a very short period of time. Not bad for a company that started out just selling a few guns at local gun shows. The EDW’s lower receiver features several enhancements over a standard AR, from an oversized triggerguard for gloved hands as well as an ambidextrous bolt release lever located above the magazine release button. Tom Miller posted a picture of a new offering dubbed the Biohazard EDW (Enhanced Defensive Weapon), and when I saw it I almost fell over. 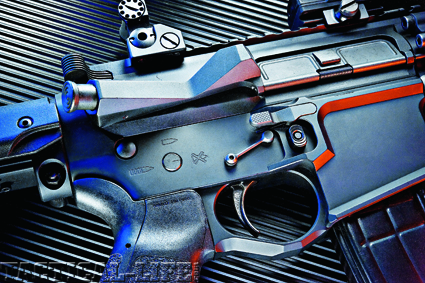 I had never seen a 6.8 SPC AR quite like it. 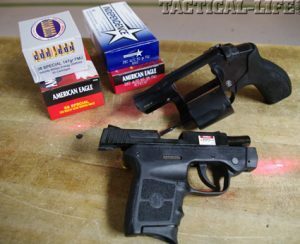 It boasted a billet lower and upper receiver, a 7.5-inch barrel, and a brand new muzzle device that’s called S.T.A.B. (Spike’s Tactical Adjustable Brake). The S.T.A.B. is not your typical muzzle device. You can actually adjust the amount of backpressure it creates, thus fine-tuning the cycling of your weapon. And you can adjust for different ammo and you can adjust the cyclic rate if you happen to be running it full-auto. I haven’t mentioned yet that it redirects blast and reduces felt recoil, making it feel smoother. You get so much from this little wonder. Everyone loves a billet lower. 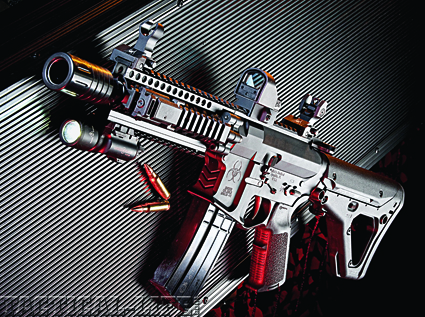 It screams, “You have arrived!” And for a weapon as aesthetically appealing as this, it’s just what the doctor ordered. Tom revealed to me that on AR lowers, forgings are technically stronger as they are compressed first, then machined. But what billet allows is options… especially if you’re going to do some things outside of mil-standard. For instance if you want one of the larger, integrated, triggerguards, or an ambidextrous bolt release built into the lower. Billet allows for thinking outside the box. On the upper half, billet has the advantage of being straighter and stiffer than most forgings, which should yield better accuracy. Tom noted credit to the LaRue stealth upper in this department.